Luvata HTS has been developing and manufacturing heat exchangers for industry ventilation for more than 70 years. Luvata heat exchangers are used for the indirect cooling of industrial equipment such as power transformers, power generators, large electrical motors and stationary diesel engines, in addition to heating, cooling and heat recovery in ventilation systems. Luvata HTS offers a broad range of products, from transformer oil coolers and Resin-Trafo and to radiators and motor / generator coolers, in addition to a wide range of industrial heat exchangers with numerous options for customisation. The Luvata transformer oil coolers are available for most transformer projects and offer a wide range of capacity variants with different installation arrangements; Luvata offers special corrosion protection when needed due to ambient conditions onsite. Luvata has manufactured and delivered transformer oil coolers to many major global power companies in the last two decades. 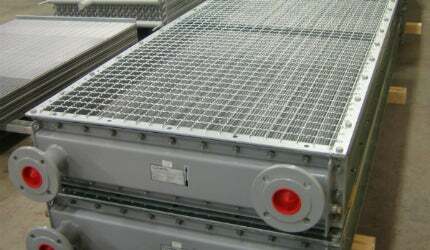 Luvata supplies radiators / air blast coolers for countless applications ranging from water cooling of large diesel engines to chillers for air conditioning and waste incinerators. Each cooler is designed to meet specific cooling capacities and noise level requirements. Luvata industrial products are part of nuclear, oil and gas deliveries worldwide. Luvata designs and manufactures cleanable coolers for electrical motors and generator cooling, where untreated sea or lake water is used. The motor / generator coolers are used for the cooling of air via circulating water and can be installed for either horizontal or vertical airflow. The cleanable coolers have removable headers and can be designed with single or double tube, made of different materials depending on the corresponding water conditions. Based on water analysis, Luvata can recommend the best combination of materials for your cooler. Luvata industrial heat exchangers and coolers are designed to work in even the most hostile conditions, whether at high temperatures, high pressures, or where the environment is highly corrosive. Luvata cooler tubes can be produced in materials such as titanium or stainless steel, as well as copper and copper alloys to best suit the environment. Luvata Resin-Trafo is a specialist product that is totally customised; it allows the highest specialisation and personalisation specifically depending on the transformer’s casing size that vary based on producer and dimensions of reference. Designed for medium-small applications, Resin-Trafo is particularly suitable for environments subject to blast dangers, where traditional oil cooling would not be suitable. Luvata is a world leader in metal solutions manufacturing and related engineering services. The company’s solutions are used in industries such as renewable energy, power generation, automotive, medicine, air-conditioning, industrial refrigeration and consumer products. The company’s continued success is attributed to its longevity, technological excellence and strategy of building partnerships beyond metals. Employing more than 6,400 staff in 16 countries, Luvata works in partnership with customers such as Siemens, Toyota, CERN, and DWD International. Luvata has launched the new High-Grade Process Cooler (HGPC), which is designed for the most stringent requirements. Luvata is a leading manufacturer of heat exchangers and coolers for a wide range of industrial process and applications.